Despite being refuted by logic and research there continue to be an inordinate amount of bodybuilding myths that just wont go away. Here are 9 to start us off and I will include more in future articles. They are in no particular order of importance but still require flagging up. This comes from the mistaken tenet that “more is better”. The fact is that when you train too often for the body to recuperate between workouts, the end-result is zero growth or regression. Working out every day, if you’re truly using the proper amount of intensity utilising compound movements (as you should) will lead to gross overtraining. A body part, worked intensely – the spinal erectors for example, can potentially take 5-10 days to recover. Additionally the central nervous system can become fried even if a different bodypart is trained the next day. The body is unable to recuperate from consecutive brutally hard workouts. The exception to this is if you are using performance enhancing drugs (PEDS) ie anabolic streroids. These will enable you to recuperate much more quickly, which is one reason why trainees who are natural should not be following the workouts of professionals. This merely results in overtraining, stagnation and illness. You must learn to accept rest as a valuable component of your workout – perhaps the most important part. You should ideally spend as many days outside of the gym as you do in it. Despite what the magazines state, or what the supplement manufacturers would have you believe, all professional bodybuilders use anabolic steroids in combination with other growth-enhancing drugs. The degree of size and muscularity displayed by professional bodybuilders is impossible to attain without drugs no matter how long or hard that you train. This is indisputable, however natural athletes can still make radical improvements in their physique by hard training, and utilising sound principles, a good nutritional program and adequate sleep. You may not end up looking like Mr Olympia, but developing a great physique is certainly very achievable, alongside the additional benefits of increased health and longevity. I have previously written an entire article on this subject but it warrants mention again as this myth still persists. You cannot change the shape of a muscle. It can only increase or decrease in size. You cannot limit growth to only one area of a muscle either. Larry Scott, for whom the ‘biceps peaking’ Scott curl was named, had great bicep development but he did not have a noticably pronounced biceps peak. The shape of your biceps, or indeed the shape of any muscle, is determined by your genetics – you have what you were born with. Also, when a muscle contracts, it does so along its entire length. This is true of any muscle, however you can still change the shape of a group of muscles, for example the thighs, by developing muscles within the group. For example the quads are made up of four main muscles and development of the vastus lateralis on the outside of the thigh (by performing for example squats with the feet close together) will give a greater sweep to the outer thighs. As further evidence, locate a picture of any young professional bodybuilder (Schwarzenegger for example) before he was particularly developed. He will have virtually the same structural lines as he did in his heyday. All that changed was that his muscles got bigger. 4. You need to otain a “pump” or “burn” during training in order to facilitate hypertrophy. Mr Schwarzenegger is partially responsible for one of these bodybuilding myths because of his infamous comments during the making of “Pumping iron”. A pump though, is merely a muscle becoming engorged with blood from capillary action. It can be achieved easily by any repetitious action under a minor load. For example swimming gives me an amazing pump but doesent make my muscles grow. The actions of swimming by no means equate to the muscular intensity needed to promote hypertrophy. The same is true of the coveted ‘burn’. A burn is simply the tangible effects of lactic acid build up, a by-product of chemical respiration. It is not a prerequisite of muscular hypertrophy. 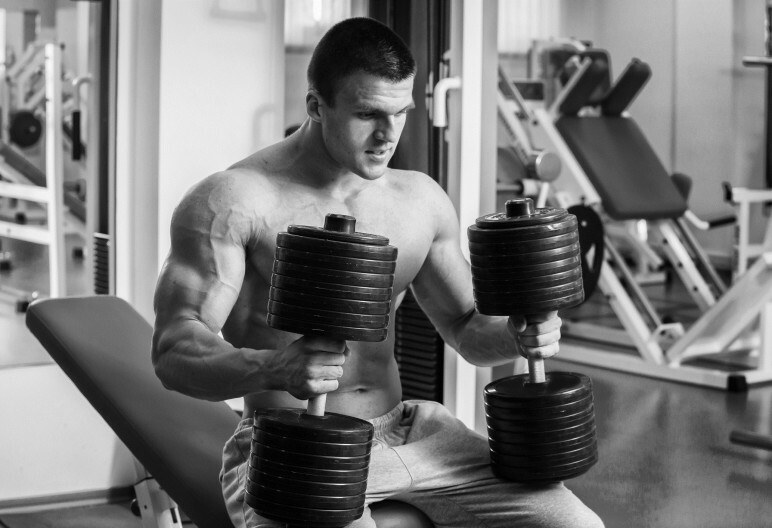 For hypertrophy to occur, you need to subject the muscles to increasing levels of tension. This is best achieved by the utilisation of progressively increasing loads. 5. Performing hundreds of sit- ups will result in a washboard midsection. This is one of the old bodybuilding myths still doing the rounds. This myth is built on the premise that exercising a specific area will remove fat from that area. The problem with this is that spot-reduction does not exist. Performing thousands of sit-ups may give you tight abdominal muscles, but they will do nothing to rid your midsection of fat. Additionally thigh adductor and abductor movements may debatably give women’s thighs more firmness, but they will do nothing to reduce fat in that area. Neither will side bends remove fat from the obliques. These too are bodybuilding myths. Unless you are using chemical assistance, nothing will rid the body of fat, except a reduction in your daily energy intake; in other words, you need to burn more calories than you ingest. Additionally the first places to gain fat will be the last place to lose it. 6. If you train like a powerlifter you will develop a “blocky” looking physique. Another one of the old bodybuilding myths. If your physique has a blocky look, then this is a genetic trait not something you created. If you were born with this physical shape, then powerlifting will simply make you a bigger “blocky looking” person. You can negate the effect to a certain degree by developing your latissimus dorsi and vastus lateralis on the side of your thighs and maintaining a trim waistline but otherwise you’ve got the shape that you were born with. Squats, bench pressing, and deadlifting should however remain mainstays of your routine, as they are important components of an effective training regime. 7. Certain nutritional supplements can be as effective as steroids, only much safer. Some unscrupulous manafacturers may state this in their advertising or infer it by marketing their product with a name extremely similar to the real anabolic compound, but nothing could be further from the truth. Supplements are generally merely what they say ie suppliments to your diet, nothing more. They are not magic pills. The only things which will be as effective as steroids are other steroids. No currently available supplement has a similar anabolic effect to steroids. However, that being said, nutrients and supplements can be very effective, especially if your diet is lacking in some critical component or you’ve missed a meal for some reason. Vitamin and mineral deficiencies are also more common than you might suppose. Additionally ingesting a good protein supplement immediately after an intense workout has been shown to increase the assimilation of muscle. Despite our commonalities, biochemically individuals can vary considerably, and what works for one person might be ineffective for another. The interplay of genetics, varying lifestyles, and dietary habits makes it very difficult to predict what will work for an individual and what won’t. There is no doubt however that food supplements have benefits which shouldn’t be overlooked. They’re also generally safe to ingest and not usually deliterious to health. They will not increase muscle mass in a similar way to anabolic steroids however. I recently saw this again on a forum response and it is quite simply ridiculous.Without getting too technical here, fat and muscle are essentially completely different substances and one cannot simply turn into the other. Now we’ve got that out of the way, what can happen that caused this myth to come into being? Well, if you stop working out, or stop applying resistance to your muscles on a regular basis, they will atrophy over time. If an individual then continues to ingest a similar amount of food as when he was training he is also likely to become fat. If only this was true, and whilst steroids will increase your limited natural genetic potential for muscle hypertrophy, unfortunately it is not a level playing field. Aside from genetics determining natural physical transformation, the physical response to anabolic steroids varies widely between individuals. Hyper-responders can show a marked response to these drugs and gain muscle mass very easily. Some individuals however have a much more limited response. Obviously individuals predisposed to being hyper-responders have a unique advantage with regard to assimilating muscle tissue should they decide to utilise anabolic steroids. Due to the differences in how individuals react to these drugs, two bodybuilders could utilise the same steroid stack, train and eat identically, yet one could become a national contender whilst the other might never even win a local contest. Hopefully this article has helped to dispel some persistent bodybuilding myths and misinformation which do nothing but add to the confusion in this industry.